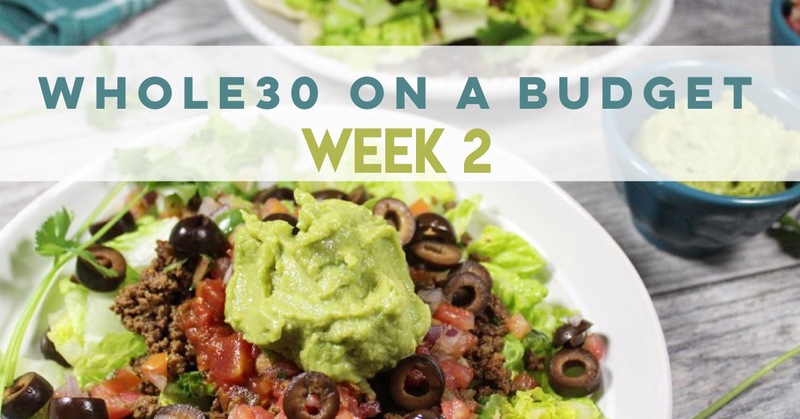 If you saw my week 1 post, you’ll know all about how I’m embarking on another round of Whole30 this month. 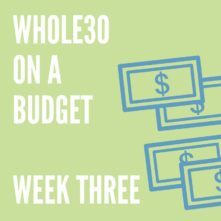 This time around, I’m keeping track and documenting all of my food costs in hops of showing you how you can do a cheap Whole30 easier than you may think. After doing 4 rounds but eating pretty much Whole30 and usually Paleo otherwise, I’ve figured out a few ways to save money on what some people might find is an expensive way of eating. 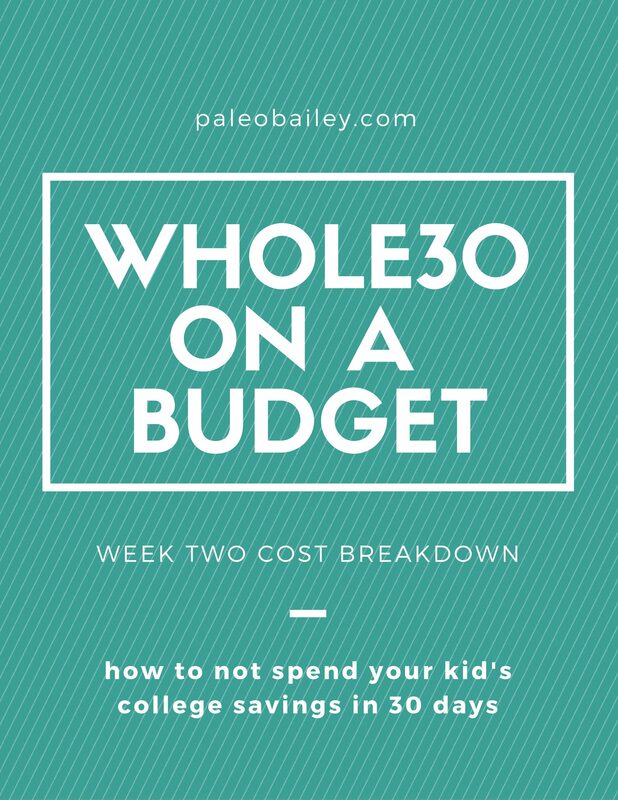 Don’t get me wrong, eating whole foods can be expensive, but there are definitely ways to shave off some costs here and there to make your food budget stretch further. 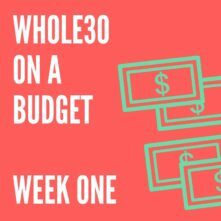 So this month I’ll be showing you how I do a budget Whole30. Welcome to week 2! This week the recipes I made were stupid-easy. 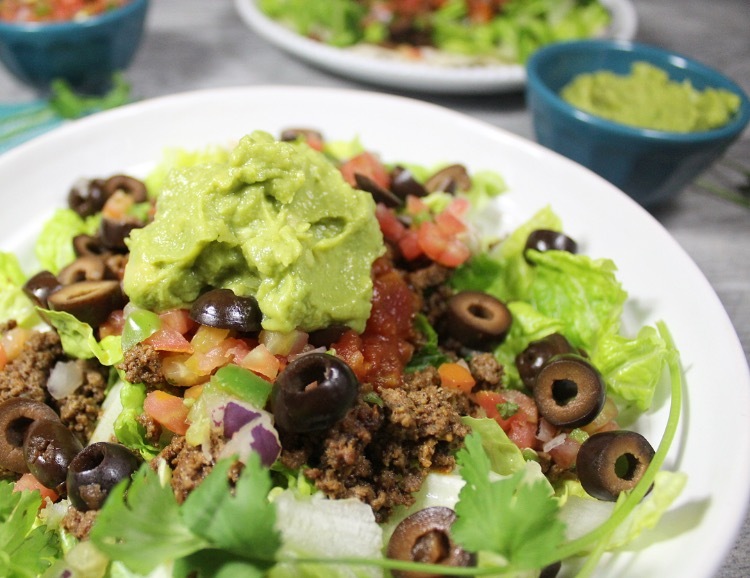 Most of the recipes I make are, regardless of if I’m on a Whole30 or not, doing a budget Whole30 or not, but this week I just didn’t have time or energy to get too complicated. I think part of that was due to the day 6, 7, 8, 9 side effects. It’s common to feel extra tired, bloated, uncomfortable and sick almost. It’s not what it seems though. It’s just your body’s way of adjusting to the new amount of whole foods you’re eating and figuring out how to burn that as energy instead of the sugar it was previously. I just wasn’t up for a marathon kitchen session. Which made me extremely thankful I had prepped and frozen enough during week 1. I told you this would save you time and money! I used the instant pot spaghetti sauce from the previous week to fill in the meals I didn’t meal prep for. This week the hardest thing for me about doing a budget Whole30 was to not rely on convenience emergency/grab-and-go foods. I usually keep my favorites like Epic Bars, RXBARs, ZÜPA NOMA soups (discount code “PALEOBAILEY” saves you 15% at checkout) and Lara Bars around for quick snacks, post workout protein or as something to tide me over when I’m out and about. I did great the first week without these, but by the second week I was missing them. When I first found Whole30, I easily completed rounds without these things – as most of them didn’t exist or I wasn’t aware of them. I think it’s gotten harder to not rely on them now just because I’m used to having them. This week I really had to remind myself to prepare veggies, nuts and fruits ahead of time in portioned out baggies. I did that about 2 times throughout the week to restock what I had used up. I cut and bagged sliced carrots, sliced celery and almond butter, almonds and grapes. These were easy for me to take with me when I needed to or just grab out of the fridge if getting to dinner was taking longer than anticipated. It helped keep me on track and not feel like I was missing out on my “easy” foods while also keeping my weekly budget way cheaper than it would if I were otherwise eating a $4 bar 5 or 6 times a week! This week I again mostly picked up all of my produce at Aldi. The sausage for the breakfast sausage, grass-fed ground beef, sliced black olives and all of the other fruits and veggies I needed were found at Aldi. In my Week One post, I talk about how impressed I am with the quality of meat I can pick up at Aldi and how the grass fed ground beef is *actually* 1/2 the cost as it is at Whole Foods. YES, I KNOW. It’s amazing. The only things I got from Whole Foods this week was compliant deli turkey, a pear, chicken thighs, rosemary, avocados and collard greens. I used other products, such as salsa and almond butter, that I had already purchased for staple items before my Whole30 started. There were a few things this week that I did to save money and a few things I did that could have saved me more. For starters, I didn’t go into my grocery shopping day with a solid plan for what I was going to have for snacks and sides. I bought a few more vegetables than I probably needed. Some carrots, broccoli, an avocado and tomatoes were still remaining uneaten after this week. I didn’t figure out how much of each I would *actually* need, causing me to purchase an excess amount of food. I could have definitely saved money, even if 5-10 bucks. So here’s your friendly reminder to have a detailed prior to shopping if you’re sticking to a budget or trying to get your food budget down. However, this will benefit me for the next week when I don’t have to purchase these items. It’s a catch 22. I really hate wasting food and that used to be a major reason eating Whole30 or Paleo was expensive for me. In order to reduce the food (and cash!) you waste, make sure you take inventory of what’s left in your fridge before planning, shopping and prepping for your next week. I’ll make sure I create meals for the first few days of the week that include the produce I have leftover first. This helps me ensure that I’m using up everything and saves me money at the store because I’m buying less! You may remember during week 1 I bought potatoes, onions and almond milk that would be used during week 2. That’s part of why my total expenses were lower. Buying produce or products that don’t go bad that quickly also helps to save me some money in the long run. I also chose to save money on buying organic in the places where I could and then put that money I saved on produce into higher quality chicken thighs at Whole Foods. I feel it’s more worth it, for me, to have ethically raised meat than it is to have organic produce that doesn’t impact my health as much. For most people, doing both organic meat and organic produce is crazy expensive and out of our normal food budget. It’s okay to make your choices about what’s important to you and NOT FEEL BAD about saving some money. I also made a few meals during week 1 that went into the freezer to help save time and money later on throughout the month. I relied on the spaghetti sauce I made for 3 of my dinners this week. It definitely cut costs this week and saved me a ton of time! The benefit of doing this during week 1 is that I still have Swedish meatballs and pulled pork in the freezer that I can pull out during week 3 and 4! I even managed to have about 2 servings of taco meat that went into the freezer to replace some of the sauce I took out. 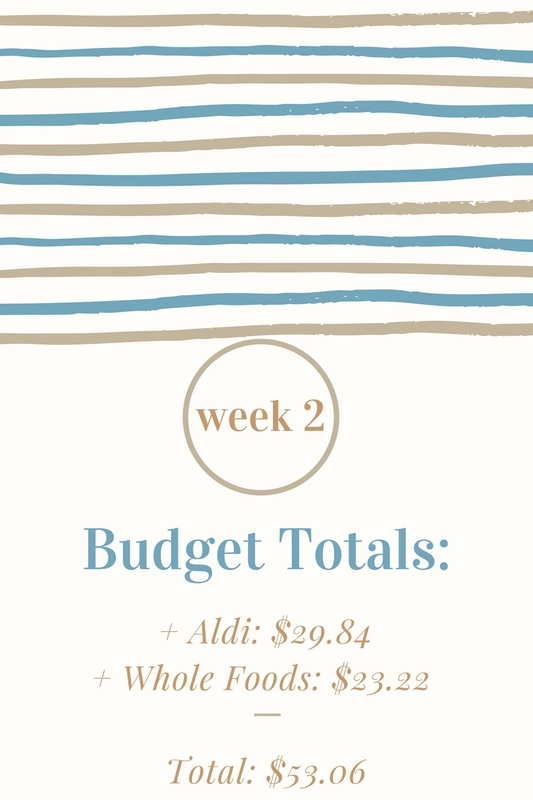 Overall, I think I did pretty well this week with my budget Whole30, even though I’m bummed I could have got that number lower and not had leftover untouched veggies. My goal next week is to try to reduce that number a little bit more. Read Week 3! Oh, and Week 4! I’m loving this budget series! Thank you! Woo!! Thank you so much! I’m so, so happy to hear that! 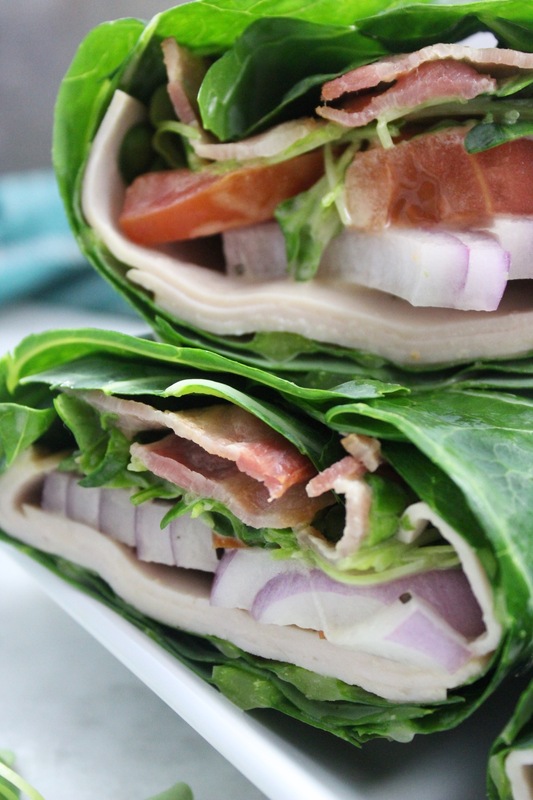 Hi Bailey – I just found your blog a few days ago, and I love all of your meal ideas! I struggle with inspiration, and it’s so helpful to see everything you eat in a week. I know paleo/Whole30 doesn’t recommend counting calories, but do you have any idea in general how many calories you consume in a day? I also struggle with finding a balance between how much my husband and I will eat and not wasting food! Have you noticed that your calorie needs/portion sizes have changed from where you started up until now? Thanks so much for the detailed response! Throwing stuff in the freezer if I know we’re not feeling leftovers is something I need to get better at doing! PS – I love that you post paleo instantpot recipes – it is literally THE best kitchen appliance invention ever!! 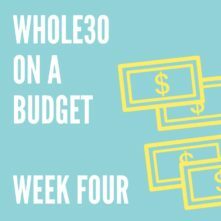 I’m impressed with your Whole30 on a budget! Especially for people in smaller areas without access to Whole Foods and co-op’s, it’s important that they know they can do a round of Whole30 without the fancy convenience foods. Keep up the great posts! Thanks, Annie! I agree! So many new products are out (and they’re awesome!) but it totally can be done without them. Getting back to the roots of Whole30 – just simple whole, natural foods – was a good reminder to me, too! And those can be found anywhere!